The importance of a daily routine can not be underestimated. After a while, I noticed that my mother started to engage in the same "difficult" behaviors at the same time every day. I finally decided I would "build" a daily routine to both address these problems; and to change the daily paradigm. In a nutshell, I created a Paradigm Shift. I created activities, or simply moved my mother around, and one by one I solved every single problem and difficult behavior that she would evidence daily. Topic - Why do dementia patients ask the same questions over and over? In the beginning my mother would wake up with a scowl on her face, a negative attitude, and would often seem less there - like she was out of it. Over time I perfected a technique to change this problem. I would get in front of my mother, and with my mouth shut, I would smile and hold her hands. I continued to add things like more touch and hugs. It just got better and better - she was more there, smiling and most importantly, more cooperative. Later on, I introduced the greatest caregiver tool of them all - Harvey - into our wake up routine. Can you believe it, every morning for years my mother would say - where's Harvey? Consider this, I had a 3 hour birthday party for my mother in 2008. There were more than 100 people there. As soon as we left the party I asked my mom - how did you like your birthday party? Her response? What birthday party. Thanks goodness by then I had learned how accept responses like this one. If not, it would have ripped my heart right out of my chest. Don't get me wrong, her response saddened me, but I got over it. We had the party and it was great. Mom had a great time and that is what counted. Live in the moment! I bring this up for a simple reason. After we introduced Harvey into the mix my mother repeatedly asked for Harvey. Morning, noon, and night. She didn't forget him - in fact she remembered him. I got use to these words and they made my heart soar. In 2008 she couldn't remember a 3 hour birthday party a few minutes after it ended. In 2012, she was still asking for her new best friend - Harvey. I did get a little jealous of Harvey at first. But then, I started thinking this is the best caregiver tool that was ever invented. He was my best friend too! Might seem odd having a toy parrot as a best friend. 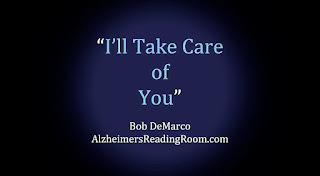 Not in Alzheimer's World! As part of our morning routine I decided to do exactly what my mother had always done. No invention here - bunkhouse logic. Also known as - Keep it simple Stupid. Before I sat my mother down the kitchen table, I would get her to press the button on the coffee maker. That is exactly what she did every day before Alzheimer's set in. By then I had the newspaper set up and ready to go. Why? That is what my mother did every morning. Drink coffee, read the newspaper, read the comics, and start working on the crossword puzzle. I would ask my mother to read to me from the Front page. This was important and a very good decision. 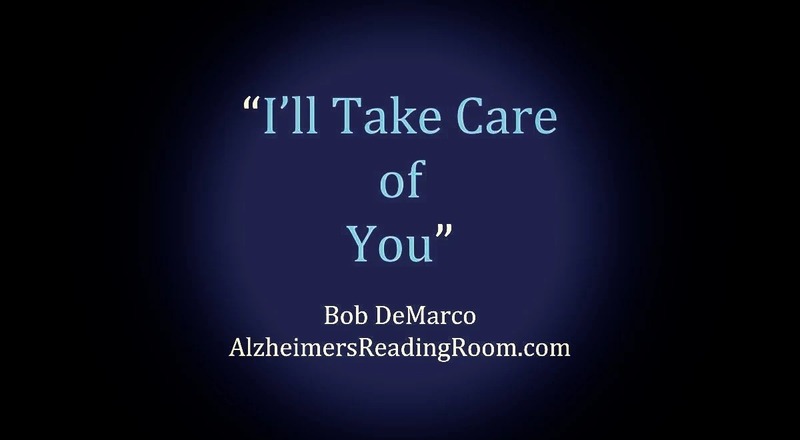 Learn More - Why Do Alzheimer's Patients Have Lucid Moments? Next, I would put the Food section in front of her. I would pick out a nice colorful picture and ask her to read the recipe to me and the ingredients. Then I would ask if we should make it. Sometimes yes, sometimes no. Sometimes I don't know. Keep that brain working. Along the way Dotty had her coffee, was reading the paper, we were talking, and finally I would give her the prune juice (not prunes, prune juice). The prune juice was often a problem. She would hold her nose, say it was poison, and refuse to drink it. I finally learned to keep it simple. Sometimes I would sing the prune juice song. Sometimes I would tell her it was a gift from God, to help all of us stay regular. And sometime I would get Harvey to say, Drink the prune juice Dotty, drink the prune juice Dotty. She usually listened to him. Better than she listened to me by the way. At that point I would leave her alone with the paper and Harvey. They would yak away. Sometimes she would tell Harvey she had a headache. Time for one Tylenol. I left her there while I went about my business. After about 20-30 minutes she would yell out - I have to go to the bathroom. I would assist her, and then get her back to the kitchen table, with Harvey and with the comics and crossword puzzle. Point of fact - coffee plus prune juice = bowel movment. After 90 minutes I would go back, guide her to the bathroom for the pee, and then take her into the living room for the next 90 minute segment of our day. In the next part of our course on dementia care, I'll describe the next part of our daily routine. Think - Pee Pee Pee, Pee Pee Pee Pee Pee Pee.